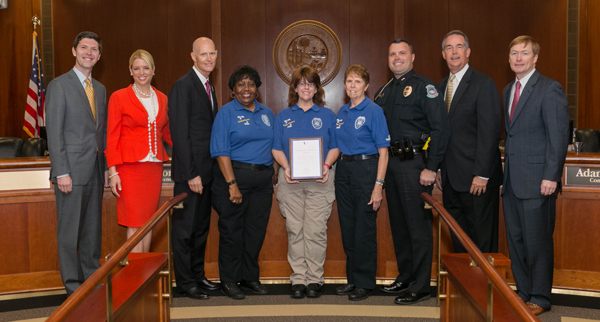 TALLAHASSEE, Fla. – Today, during a meeting of the Florida Cabinet, Governor Rick Scott and Volunteer Florida CEO Chester Spellman awarded one individual and one volunteer program with the Champion of Service Award. Sarasota Downtown Ambassador Program, Sarasota County – The Sarasota Downtown Ambassador Program is part of the Sarasota Police Department’s Citizen Volunteer Program. The organization provides unique services to the Sarasota community by supporting Sarasota law enforcement officers and assisting with the prevention and detection of crime. Volunteers also assist in searches for missing children during parades and events and other investigations. 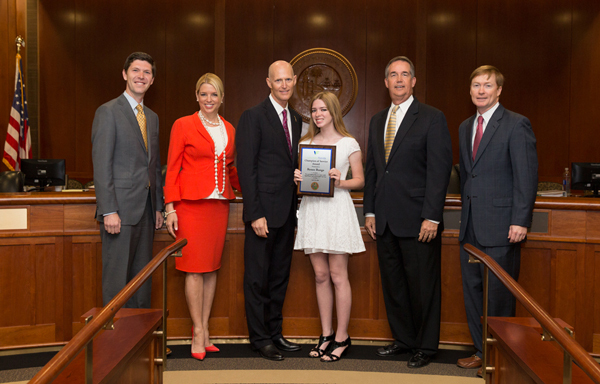 Renee Runge, Palm Beach County – Runge is a high school junior and the creator of Community Angel Network, Inc. (CAN). The non-profit organization started in 2014 and lists an online directory of nearly 200 nonprofit organizations in Palm Beach County to link volunteers with service opportunities. Students work collaboratively with CAN to create their own service projects to benefit various charities. CAN has been recognized by the School District of Palm Beach County, Points of Light, and many other organizations for its success. Since middle school, Runge has more than 1,500 hours of community service in Palm Beach County.